After an memorable 28-25 victory of England last weekend injury stricken side Wales ensured their qualification to 2015 Rugby World Cup knockout stages with their third straight win and this it was Fiji in a close game 23-13. Wales looked tired in second half and had to hang on to their narrow lead but in the end they made it through but without the bonus point. This is how the current state of pool a looks like. Making England vs Australia even more important considering how this group is panning out. Wales needed that bonus point to ensure their qualification to the knockouts but they will be happy with the 4 points and the win which put them first in the pool a with 13 points should qualify for next round. This might be a banana skin for Wales as they are dealing with so many injuries at the moment but Wales should have enough in their armour to see off Fiji and seal their qualification. 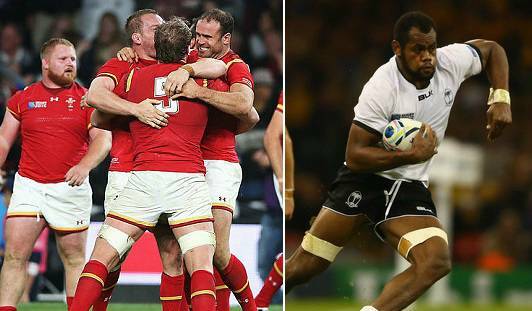 Wales vs Fiji Preview: Fiji shocked Wales 8 years ago in 2007 world cup when Fiji defeated Wales with a 38-34 scoreline to knockout them out of the world cup, Wales of course are a much improved side these days and they can seal their knockout berth with a win against Fiji. Since the game will be played at Millennium Stadium, Cardiff they home support will be the key. Team News: Wales have made three changes to the lineup which took the field against England where Matthew Morgan, Tyler Morgan and Alex Cuthbert coming in for respective injured players. While Fiji has made as many as 6 changes in the lineup which took the field against Australia last week. Biggest blow is Nemani Nadolo who is ruled out through injury. Wales manager has put faith in some of the fringe players specially in the forward line after Wales terrible injury hit world cup. Tyler Morgan (20 year old) will be the one to watch out for. Wales are 2/11 favourites and if they can get the better of Fiji in first half game will open up for them in the second half and I can expect a close victory for Wales.